Joint Venture by Elizabeth Maddrey is a wonderful contemporary Christian romance novella. It is the prequel to the Grant Us Grace series and I absolutely loved it. I love everything that Elizabeth Maddrey writes. 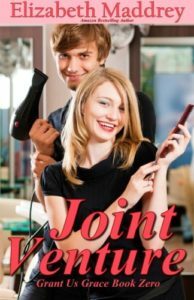 Joint Venture is a novella about best friends and new beginnings. Hairdressers Matt and Laura are friends who support each other. Their relationship is wonderful to read. They are both friendly and caring. Elizabeth Maddrey writes in such a way that I can ‘feel’ their friendship and it is a complete joy to ‘watch’ their interactions. The new beginnings is in both Laura’s personal and professional life. New beginnings can be scary and new beginnings can be fun. As the reader I could both ‘see’ and ‘feel’ the excitement and intrepidation as Laura planned a new venture. The novella deals with the theme of forgiveness. When one is wronged, the hurt can build up inside you and destroy you from the inside out. Forgiveness is necessary in order to move forward in your life. Forgiveness is freeing but it does not necessarily mean restoring bad relationships in your life. Faith is an important part of the novel. Both Matt and Laura go to Church. Church is important as it is a place where believers can build each other up to strengthen each other for the week ahead. I love Elizabeth Maddrey’s writings. If you have not read any of her works, you are missing out. Try Joint Venture today. It’s just perfect for an afternoon’s read.